Frank was born and raised in the Flathead Valley of northwestern Montana. He went to Art Center College of Design in Los Angeles on the GI Bill following his service in the Navy during Korea. He then worked as an illustrator at several advertising studios in Detroit for 11 years, winning two Silver Art Director Medals of Excellence for his work. Upon returning to Montana in 1972, he was commissioned by the National Park Service of the Dept. of Interior to sculpt 42 medallions that were cast in bronze and in silver commemorating all the National Parks for the Centennial of Yellowstone, which was the first National Park. Since 1972, he has painted the western scene, becoming a student of western history and western life. 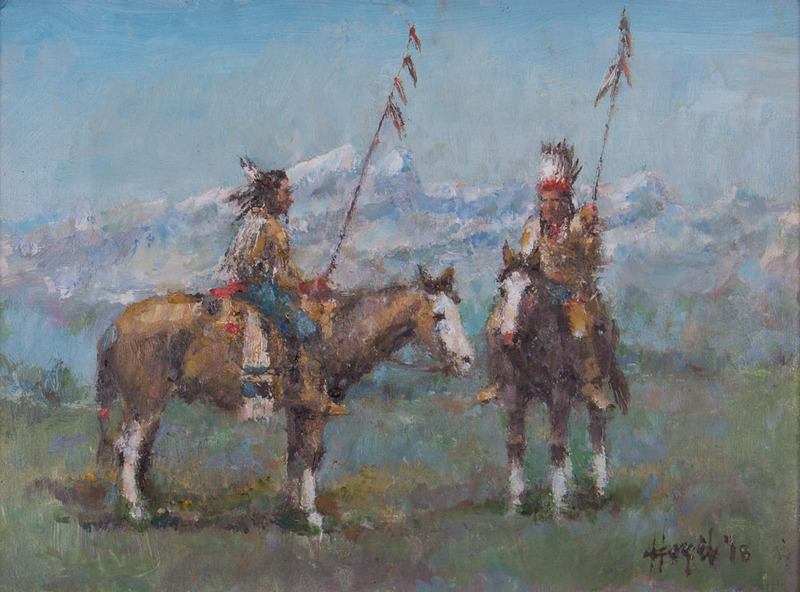 His work depicts both historically significant events and the daily life of Indians, explorers, trappers, cowboys, wildlife, and all things Western. For the Lewis and Clark Bicentennial, he completed a corporate commission of a dozen paintings, three of which appeared in The Smithsonian Magazine’s coverage of the Expedition. His paintings, known for their authenticity, are found in private and corporate collections across the country. Frank lives and has his studio in a log barn on the banks of northwestern Montana’s Flathead River and often succumbs to pursuing trout on his favorite mountain streams, poking a load or two at game birds, or coaxing a golf ball around a course near Glacier National Park. He and his wife also have a home on the Rocky Mountain Front in Augusta, Montana.